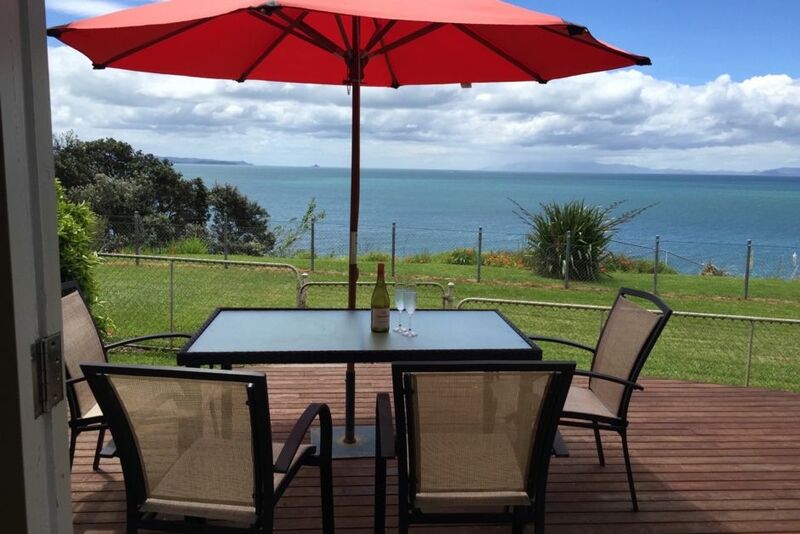 Perched on a cliff and having an awesome view all the way from Ponui Island to the Coromandel, this cute and newly renovated kiwi bach is only a short walk to the beach and a 10 min drive from Kawakawa Bay and Tapapakanga Regional Park. This gorgeous unspoilt haven is perfect for kayaking ,boating, fishing, swimming or just having a serene walk on the beach . Very safe beach great for swimming. Close to mountain bike tracks, great picnics areas and world famous bird watching foreshore. 3 min walk to the general store that stocks a wide range of goods as well as takeaways. There is a big backyard for parking a boat and 2-3 cars and a big back lawn for running around. There are 2 decks each with twin opening French doors leading from the living area. The one at the front is North facing with expansive sea views and one at the back faces a little courtyard with a BBQ, overhead sail , outdoor gas heater and a chimenea with a ponga log wall backdrop. 2. A modern kitchen with stainless steel dishwasher, microwave , coffee machine and fridge. The dining area and living area flows from the kitchen. 3. Three modest size bedrooms . One bedroom has a Queen bed while the other 2 have single beds. Two of these bedrooms have sea views. A separate sleep out with large bedroom and sea view . This has a Queen size bed with its own ensuite and sitting area . This could be let out for an extra $120 a night . This is not included in the main listing. Well equipped house with stunning views we did not want to leave ! Just what we needed for a relaxing break, very handy to shop and short walk to beach . The location/view is amazing. Clean, modern property with all the comforts of home. We would definitely stay again, next time for leisure/holiday purposes. Highly recommend. Lovely house, amazing view, close to the shops and beach. Lovely house, amazing view, close to the shops and beach. Totally relaxing. Great sea views from the property. Great sea views from the property. Modern spaces and furnishings throughout. Lovely home and great location with amazing views! Lovely home away from home, in a great location.